MILWAUKEE (AP) — Jimmy Butler was absent as the Minnesota Timberwolves wrapped up preparations for their preseason finale Friday night. Butler has demanded a trade but returned to practice with the team Wednesday, a session that included him verbally challenging teammates and coaches. He was not with the team at Friday’s shootaround in Milwaukee. Coach Tom Thibodeau, speaking publicly for the first time since Wednesday’s practice, said Butler was doing conditioning work in Minneapolis and had not been suspended. 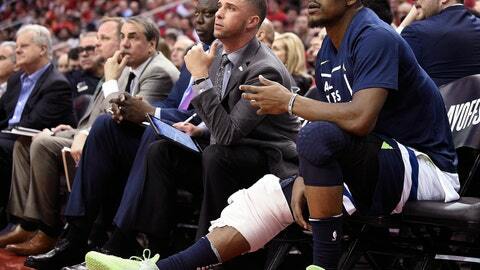 Butler told ESPN following Wednesday’s practice that his issues with the Timberwolves have not been fixed. Center Karl-Anthony Towns would not address what happened at that practice or whether a players’ meeting was held Thursday. Timberwolves forward Taj Gibson, who played with Butler in Chicago, said he did not think Wednesday’s practice was out of the ordinary. “I felt it was like a normal practice, but it was new for guys,” Gibson said. “It’s only our second year together (in Minnesota), but I’ve been around Jimmy for a long time. The saga with the four-time All-Star started in mid-September, when it became known that Butler told Thibodeau that he wanted a trade after a season in which he was Minnesota’s leading scorer and helped the Wolves snap a 14-year playoff drought. Thibodeau said he would not comment on Butler’s reported criticism of Towns and Wiggins. He acknowledged his team would have to deal with the constant media attention over the situation and whether Butler will be traded. Butler was brought to Minnesota prior to last season to reunite with Thibodeau, the former Bulls coach, and bring leadership to a young team. The Timberwolves reached the playoffs last season and lost to Houston in the first round. Notes: Wiggins was not with the team Friday, remaining home while awaiting the birth of his first child.